Posted by:	Sharla Flohr, Ph.D. This ruling could substantially increase PTA in situations where Applicant delay was subtracted due to filing a “Supplemental Paper” under 37 CFR 1.704(c)(8). Patentees are urged to review recently issued patents and continue monitoring PTA calculations for errors in Applicant delay calculations until the USPTO issues new rules to implement the holding in this case. In a decision issued yesterday, the Federal Circuit reversed the District Court’s grant of summary judgment against Supernus Pharmaceuticals, Inc. (“Supernus”) and remanded the case for further consideration. As background, the patent at issue (US 8,747,897) was granted to Supernus with an award of 1260 days of patent term adjustment (“PTA”). Supernus filed a request for reconsideration of PTA with the USPTO arguing that the deduction of a 646-day period for filing an IDS on November 29, 2012 after the filing of an RCE on February 22, 2011 was improper. The USPTO rejected the request for reconsideration based upon the Federal Circuit’s decision in Gilead Sciences, Inc. v. Lee holding that submission of an IDS after the filing of a response to an election or restriction requirement is subject to a reduction under 37 CFR 1.704(c)(8) because any relevant information submitted to the USPTO after an initial reply interferes with the USPTO’s ability to process an application. On the basis of the plain language of the statute, we hold that the USPTO may not count as applicant delay a period of time during which there was no action that the applicant could take to conclude prosecution of the patent. Doing so would exceed the time during which the applicant failed to engage in reasonable efforts. 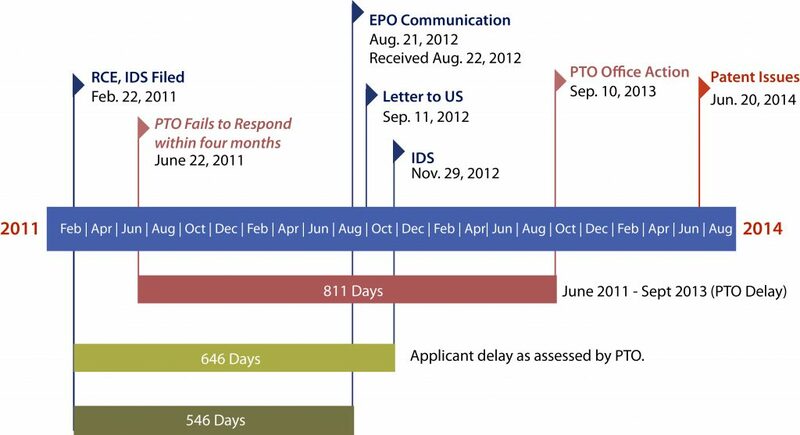 Although this ruling clearly implicates periods of applicant delay based on filing an IDS after the filing of a response (i.e., supplemental papers under 37 CFR 1.704(c)(8)), it could have broader implications for any period in which there was no action that the applicant could take to conclude prosecution. It remains to be seen how the USPTO will implement this ruling in its automated calculation of PTA. In the meantime, patentees are strongly encouraged to review all PTA calculations of applicant delay and file requests for reconsideration with the USPTO as warranted.